Living on the boat for a week, I had gotten very comfortable with BumbrÉ and had enjoyed the lovely weather. It was also the weekend of the Buzzard’s Bay Regatta, that was being sponsored by the New Bedford Yacht Club, so many mornings I was awakened by what seemed like thousands of Lasers parading out of the harbor for the day’s races. It was quite a wonderful site that was repeated in reverse during the late afternoon when they started back in. On Friday, I was joined by Jen before our Saturday morning sail to Cuttyhunk. After all the work I’d done, most everything was stocked and ready to go on-board. We had dinner at the Riverhouse Grill in South Dartmouth with the regatta crowd before heading back to the boat for a good night’s sleep. The morning was wet and foggy, and we slept late. At 8:45 we crawled out of bed to watch the procession of regatta boats out of the harbor. As we were waiting for the weather to improve I gave Jen a short navigation lesson and showed her how to check the engine oil. At about 10:45, just as the sun peaked out from behind the clouds, we headed south toward Cuttyhunk. 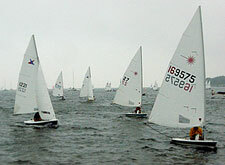 As we tacked back and forth in the fog toward Cuttyhunk Island, we heard numerous boats and waited to watch them pass. As this was happenning, I remembered our radar, which we had yet to use. I switched it on and we started to pinpoint the boats on the radar, which we could hear far before we were able to spot the boats through the fog. As we neared Cuttyhunk, the fog began to lift until we had about a 1 nautical mile of visiblity. About 1:20 P.M., we spotted Penikese Island just north of Cuttyhunk and kept it on our starboard so we could head into the channel leading to Cuttyhunk. 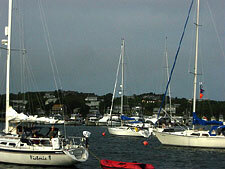 Soon after, we lowered the sails and headed toward Cuttyhunk Harbor. We entered the harbor and started searching the mooring field for one of the $35 moorings. We found one in the midst of the crowded mooring field surrounded by other boats no more then 20 feet from the next boat. 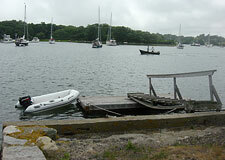 The harbor was packed, but at Cuttyhunk that doesn’t seem to matter–you just don’t seem to notice the other boats. You seem to get lost in the natural unspoiled beauty of the place. We headed into shore to have a walk around. It had been years since I had walked on Cuttyhunk, and Jen had never been there. We just hoped the weather would improve a little. 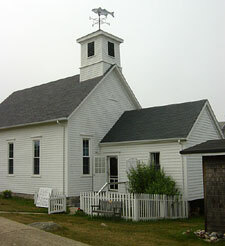 We checked out the market and the famous church with the striped bass weathervane before walking up the hill toward the uninhabited part of the island. 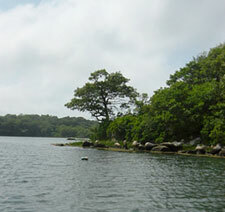 After walking back toward town, we started for the beach on Buzzard’s Bay–on the northern part of the island. After a cool swim we started back toward town past the Cuttyhunk Yacht Club. After spending the summer near the New Bedford Yacht Club, the Cuttyhunk Yacht Club was a welcome disappointment. 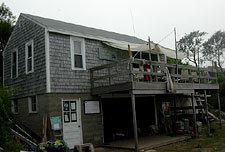 The modest club is housed in a small shack-like structure on the outskirts of town in an area of the harbor goes dry at low tide. Its small porch is shaded by an old sail, draped overtop like an awning. We got back to the boat and started preparing dinner and settling down to enjoy the rest of the day on the water. We would have loved to take a shower but our $35 payment did not include such amenities. During this three-day weekend, it would be saltwater showers for us. After dinner and a movie on the laptop computer, we got to bed looking forward to our sail to Hadley Harbor tomorrow. We awoke in the morning to much of the same foggy weather we had the day before. Since the weather wasn’t cooperating, we were in no rush to get going, so I headed in to fill the water jug and check out the action on the docks. We finally got under way about 9:30 A.M. with a parade of other boats. With a light wind we put up all the sails and hoped we could make a fast run up the Elizabeth Islands. This didn’t happen and we slowly made our way past Quick’s and Robinson’s Holes, making under 4 knots. The upside is that we had time for some slow-sailing maintenance: we oiled the teak rails and soon were headed past the Weepecket Islands. At 12:30, we entered the channel between Wood’s Hole and Naushon Island following another boat who had left Cuttyhunk with us into Hadley Harbor. What few moorings there were in Hadley were taken, so after a search for the perfect spot, we picked a place south of Bull Island in about 12 feet of water. We set down the hook hoping our audience didn’t know it was our first time anchoring Bumbré. Fortunally, there was no need to worry as we caught on the first try and settled into what was slowly becaming a beautiful day. 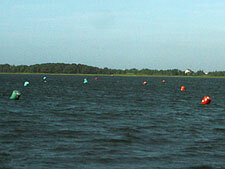 Hadley Harbor is the main harbor for the Elizabeth Islands. 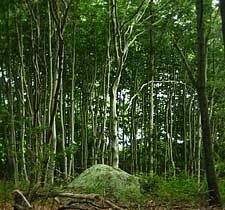 The Elizabeth Islands are a private group of islands off Cape Cod owned primarily by the Forbes family. Most of the islands are part of a land trust, which means they are protected from development. 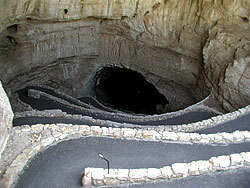 Unfortunately, because the islands are privately owned, they are not generally accessible to the public. The only island you are aloud to explore is Bull Island, which is a small island just to the north of the main anchorage. When we got there we headed off to Bull Island to have a look around and swim. We walked the trails, avoiding the acres of poison ivy, until we reached a nice pebble beach where we good relax. We collected a few shells and continued our walk, which didn’t take long as the island is quite small and the parts that aren’t covered in poison ivy are covered with swampy lowlands. It’s still beautiful, but a nature walk on the island will certainly take less than an hour. We’d read in the cruising guide about all the great gunkholing to do around near the harbor, so we decided to take the dingy and explore some of the smaller islands that surround the anchorage near the main island of Naushon. Most of these island have at least one large house on them and nothing else. We headed out exploring the different holes around the islands and even finding a few outlets into the Vineyard Sound. Since we were only in a nine-foot dingy we didn’t venture out too far. The day, which had begun much like the previous one with foggy overcast skies, was now beautiful and sunny. After a little while, we decided to take a dip, so we headed back to Bumbré to swim off the transom. After our “bath,” it was time to enjoy the rest of the afternoon from the cockpit. This is where the yachtsmen participate in one of there favorite activities, watching others anchor. We were fortunate this day as, besides the normal issues people have while trying to put down the hook, we had gold medal winner for incompetence in our midst. At around 4:30 we witnessed a brand new 42-foot Hunter named Idle Flyer come into the anchorage under power. We should have known by the fact that her port of call was in West Virginia, a landlocked state, that this was not going to be just another simple anchoring. The effort started the way most unsuccessful anchoring attempts do: they dropped anchor too close to the boat behind them with most of the chain from the anchor locker, and before long they had drifted into that neighboring boat. They of course were so concerned with whether the anchor was holding that they didn’t notice this until the other boat made enough fuss of fending off that the skipper decided that this first attempt was not going to work. From here things really started to get interesting. After shouts at his wife to raise the anchor using the electric windlass failed to get the desired effect, the skipper stomped forward to do it himself, whereupon he failed to get the anchor chain to move. As the people from the other boat fended him off, he went down below to investigate the problem. The problem must have been a blown fuse, and soon the windlass was working again, briefly. After about 10 seconds it was again not doing its desired function. After pulling away from the other boat, the skipper again disappeared below, and again the windlass started working again–this time a little longer than before. By now, everyone in the anchorage had taken their seats for the show, which was starting to get interesting. After a verbal exchange between the fustrated skipper and his confused wife, the skipper decided he had better cut his losses. This is when he did the most unadvised thing anyone could have done in his situation. He decided to motor out of the crowded anchorage full of buoys and anchored boats (including ours) with his hook dragging on the bottom. I couldn’t take my eyes off this spectacle. All I could manage was to stare in shock as the left the harbor still working on getting the anchor up. Just as they were close to leaving view, I watched as the large CQR anchor surfaced from the water slamming into the side of the boat before coming to rest in the pulpit. My wife and I wondered if they would come back and give it another shot, but we didn’t see them again that day. We awoke the next morning and went on deck for some breakfast. Once outside we noticed commotion on Bull Island. It seems, sometime early in the morning, our friends on Idle Flyer had returned and run themselves hard aground. Now a few other people in the harbor were helping in their tenders. It looked as if they could use another hand so I put down my granola bar and headed over in our dink. When I got there the wife of the skipper and two others in there dinghies were struggling with the CQR anchor so they could take it out to help kedge the boat off the bottom. They had soft bottom boats so I put it in our hard bottom dinghy and threw it over about 75 feet off the port bow. It seemed that turning the bow toward the deep part of the channel gave them the best chance of getting off. So we moved our dinghies over to the starboard side to help push them out. Of course the windlass didn’t want to cooperate again, in much the same way it hadn’t cooperated yesterday. But today there was a new problem, while the skipper’s wife was very pleasant and appreciative of our help, the skipper was not. In fact, he would hardly acknowledge our presence. So as we turned his bow he ignored our request for him to give the boat a little gas instead only wanting to fiddle with his still-broken working windlass. Finally he noticed we were moving him and decided that he should give the boat some gas. So yelling at his wife to forget the anchor he moved the boat clear and into deeper water. After much thanks and offers of cocktails later from his wife we started to leave the rest of the job to the skipper. He was less than thankful, so the group of helpers started to disperse. I noticed as I was headed back to our boat that the skipper had again started to fiddle with the anchor still down just as yesterday. As this went on, I watched as the boat drifted right back onto the bar from which we had just unstuck them. By now, I was back on Bumbré and decided to sit this one out as the anchor was still deployed and some others were still there to help. This time the anchor windlass worked and they pulled themselves off with help, before the tide stranded them for a much longer time. We would not be staying for cocktails later in the day and we started to prepare for our departure back to South Dartmouth. The morning, which had started out as a beautiful sunny day, had deteriorated. The wind picked up and the clouds began to roll in. We got the anchor up with no problem and set northwest course toward Padanaram. The wind was from the south and refreshing with gusts up to 25 knots. During the sail, the wind blew down the bimini, so we packed it away. The unsettled weather got worse the closer we got to home. About a half hour away it started to rain and the closer we got, the harder it rained. We got back to the car to head home but we were presented with a problem. When I was dropped off over a week ago we found the dinghy deflated laying alongside the harbormaster’s shack. A police officer said he found it in the parking lot and put it there to protect it from damage. It turns out there is a pecking order to pulling your dinghy on the beach by the launch ramp in South Dartmouth. We did not know this; it turns out we were in the wrong spot, so the “owner” of this piece of beach kindly moved our dink into the middle of the parking lot… Very courteous. Thanks to the nice police officer, it was saved from too much damage, but now we were reticent to leave it on the beach again. So we struggled to deflate the dink so we could stuff it in our car. This was not an easy exercise and one we would not be repeating soon. It was now getting close to the date when a decision had to be made. Do we stay, or do we go? We’d planned all year as if we were going on this extended trip, but the date was approaching when Jen would have to give notice at her jobs–the biggest change yet. Because of this, we did not get down to the boat until Saturday morning. We were just going to get some work done and have a short sail in the afternoon to practice man-overboard or heaving-to. But since it was such a nice day we decided to cruise somewhere. Since it was late in the day, we decided to go somewhere close, we looked at Westport among other places, but in the end, we chose Nasketucket Bay, between West Island and Fairhaven. The guides didn’t say much about this place except that the entrance was marked and maintained privately and that there wasn’t much there. 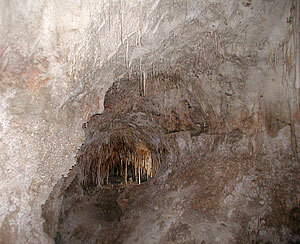 We decided to investigate anyway, and we headed out about 12:45. The last time out, we sailed off the mooring, so this time we decided to try it again. Our earlier effort was not unsuccessful, but this time went even smoother as we glided right off the mooring and right on course. Unfortunately, our algae problem had resurfaced and clogged the speedometer again, so that was not going to help us this leg of our journey. We headed off in a nice southerly wind of about 10 to 15 knots, which would push us right to Nasketucket Bay on a beam reach. Bumbré made good time, averaging over 5 knots most of the way until we rounded West Island. The chart showed around the point of West Island was bordered by a fish pen in the water. We quickly spotted the yellow bouys marking the pen and kept them far to starboard. As we started to near the northly point of West Island, we started to look for the private navigation aids that the chart showed. We didn’t expect much to go by so we called on the radio and cell phone but recieved no response at Earl’s Marine, so decided to go at it solo. This proved tough for someone looking at a chart dotted with rocks and shallows, with only “privately maintained” navigational aids. We spotted a large floating buoy that looked like a yacht racing marker. I assumed this was one of the navigation markers and headed toward it. As we got closer, I looked through the binoculars and saw a line of lobster buoys and headed off from the marker I had previously seen. This made me feel very nervous, as it seemed highly unusual to mark a channel with a continious row of roped lobster bouys. I decided to make a quick retreat, not wanting to chance running into what I assumed was another fish pen. We started back out of the bay, feeling better having not chanced running aground or worse. About halfway past West Island, we got a call on the cell phone from Earl of Earl’s Marine. He gave us local knowledge about how to approach the bay without running into trouble. When I told him about the marker I had seen he informed me that this was part of a huge scallop farm that for some reason had not found its way onto the charts. We were told to turn to port about 100 yards before the marker and head due west until I saw green and red markers, after which we were to follow them just as you would normal navigational markers. It all seemed simple enough until we started to look for the green and red markers. Fortunately, this time we had another sailboat to follow. Spotting the markers wasn’t easy as they were far from where the chart indicated–actually much closer to the harbor itself–but finally we found them. As we approached the narrow channel our depth alarm started to sound nonstop. Jen, being nervous about grounding, wouldn’t let me turn it off, so we continued in with the alram going off incessantly and reading that were consistenly under 8 feet. Earl had assured us that there was plenty of water for our 5′ 3″ draft, but this didn’t keep me from joining Jen in the realm of the nervous. Finally we made it through the channel and into the equally shallow harbor. We got on our mooring which was right near the docks and headed ashore. After paying for our mooring, showers, ice, and bathroom ($15), we headed across the causeway to explore West Island. After watching a fisherman pull in a striped bass with the local police waiting idly for something to do, the excitment went downhill. Our walk on West Island was uneventful and after awhile we went back to the boat to take a swim. Our swim progressed into cleaning the underbelly of Bumbre, which was overdue, this in turn got me to dive under the boat and clean out the speedometer to get that working as well. A failed or neglected city springs to mind when walking around Macau during the daytime. Around the outskirts of the islands, the doors of modern buildings never seem to open. In hotel restaurants, servers tend to sole customers with reluctance; public gardens remain empty except for the lone tramp rooting around in the bins; roads remain unsullied with tire tracks; and very often, the silence is pervasive. Inland and up the hills, cracked and uneven pathways run into the next as weeds compliment cement on crumbling gray walls; unpainted fences balance precariously around paved basketball pitches, and graffiti adds color to an otherwise drab setting. The Portuguese gave this place some amazing architecture when they ruled and controlled the two islands and small mainland peninsula that is Macau. In fact, Macau was the first European settlement in the Far East. The Portuguese beat the Dutch and British by a hair’s breadth with their establishment of this well-positioned and soon-to-be-rich trading post. Hong Kong, Singapore, and Malacca followed many years later as the British, Dutch, and other nations established a presence in East Asia, but at the beginning, through Macau, Portugal ruled the roost. The Dutch tried many times to get hold of the territory, as did the Spanish and British. But Macau had become Portugal’s prize jewel, and they managed to retain control throughout, only giving it up in 1999 when they handed it back to mainland China according to treaty arrangements. China now rules Macau under what has become known as a Special Administrative Region, or SAR. This basically means that Macau falls under the Mainland Chinese policy of “one rule, two systems,” a status quo by which Macau governs itself for the most part, as it makes and lives under its own laws, but strictly speaking, belongs to China. Today, Macau is often described as a little paradise steeped in mixed history and culture. Large, imposing, centuries-old structures vie for space among the tattered remnants of cheaply built twentieth-century brick houses and towering modern glass offices. Massive and squat stone office buildings of the colonial era sit regally and steadfastly among haphazard stacks of steel girders, gray stone snubs orange brick, and the slate roofs keep out the rains where tin cladding has long since failed. New roads bend around the coast in smooth ribbons, flowing over long and impressive bridges before swooping gracefully in arcs past flashing billboards and over reclaimed land. Newly built high-speed, two-lane motorways whiz past glittering hotels that invite money to be spent, then descend to greet history by way of Macau’s Portuguese heritage. Working inward and upward modern tarmac meets old cobbles as the flat ground turns into a steep climb. Little lanes wend through neighborhoods that crowd in upon themselves. Antiquated buildings lean against each other and dangle precariously over paths that defy the eyes to follow. Hanging baskets of colorful flowers swing delicately from balconies that threaten to pull down the houses to which they belong, while open windows give glimpses into the crowded lives inside. The steel and glass facades of hotels and office blocks, the colonial stone museums, and Portuguese Officialdom of yesteryear that grace the flatlands around the coast are left behind when walking inland. The hilly centers of the islands house the majority of Macau’s population; and looking in one direction at these historic structures, the place seems to emulate a fishing village in Portugal, but turn your head and you may liken the view to one of the many “Chinatowns” seen around the world. But all is not as it would appear. Compared to the heat of the day, when cool drinks and light food go together with quiet streets and an easy stroll, the evening brings dramatic change. From the dull and fading brick work and the overgrown flowerbeds–from the graffiti and flaking paint on shop walls–springs lights of dazzling proportion. At night, a seemingly forgotten city emerges in a glittering display of neon power that transforms this place and everything into a hive of activity and purpose. As the sun sets over the horizon, people come out to play, tourists put aside their bathing towels and no longer think of cold air, workers get ready for the night ahead, and hotel lobbies are transformed from desolate halls to crowded and bustling meeting points. As night falls, policemen wipe the sleep from their eyes and come out of their cubby holes, ready and watchful for the evening ahead. Large-muscled men hang around doorways, arms folded across their chests as if to say, “make trouble and you will have to deal with me;” and jewelers open their doors to invite tourists to buy gold at what they say are the cheapest prices in Asia. But what is really going on in Macau? Why do most people prefer to sleep during the day, workers and tourists alike, and what changes the city from a neglected place under the sun to a fun-filled bundle of activity in the night? 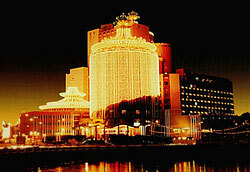 The Macau government makes seventy percent of its revenue from gambling and associated businesses. Most Hotels are built with gambling in mind and thus they boast many casinos and gambling dens on their premises, all with sumptuous rooms and services to woe the big spenders. Limousines carry the rich to their destinations of the evening. Hotels offer special packages for those with money to lose, and girls lie in wait to help spend money that prospectors may have had thoughts of keeping. Bars keep drinks flowing to loosen punters stiff fingers, fast food is lavished on the high rollers, and the large-muscled men have no qualms of throwing out the losers, arms aching as they ceaselessly open doors for the excited newcomer and help the defeated on their way. The city changes for all who are in it when the casinos open each evening. Once sleepy hotel lobbies come alive, and receptionists hurry to check-in new arrivals by the hundreds as tours from Mainland China pour off trains like ants from a mole hill. Airport-staff sweat freely, as planes land in quick succession to disgorge determined gamblers from Taiwan, the Philippines, Singapore, and other corners of the world. Time is money that will be spent, one way or another, despite a gambler’s dreams of striking it big. Newly arrived punters race against time to grab their bags, get through immigration, and to catch a cab for their hotel and the casinos next door, above, or beneath. Not all visitors to Macau are gamblers on a mission, however. Some are genuine tourists who wonder why the city is so bare and drab during the day and have no idea of the other face of Macau at night. Others still are from Taiwan and other first world Asian economies, and they usually come in the form of a group or package tour. Should you see these arrivals as they emerge from their planes, you will notice that they are all male with an average age of around seventy years. This is a special type of arranged tour, in that they are going to Macau specifically to find women. This other side of Macau is reflected in the availability of prostitutes who service overseas visitors or who relieve punters and gamblers of any change that may still be jangling in their pockets. Prostitutes hang around doorways and exits from casinos, they balance precariously on high heels, and they are covered in layers of make-up that gives competition to even a skilled plasterer. Skimpy skirts ride high on slim legs and breasts heave against tight tops. Purses swing invitingly from wandering hands and sugary smiles are issued freely to those who stop to look (and glares are given to those who walk by). As night draws on, promises of a new life are offered to punters who leave one casino in search of new ground, despite their nearly empty pockets. Fresh arrivals are given their choice of female company as they prepare to spend money and while away the night among the bells, whistles and bright lights.. A kaleidoscope of women–and men dressed as women– stand around doorways offering the suggestion of adventure and love with husky voices and girlish smiles, giving nighttime Macau a decidedly sinful air. A neglected city it may be during daylight hours, but prostitutes, bouncers, gamblers, airport staff, taxi drivers, croupiers, fast-food hall owners, barkeepers, bus drivers, doormen, receptionists, bankers, service engineers, thieves and security guards need to sleep during the day, so that when the sun sets they will be ready for a new night of action. And the only daylight customers you’ll see are the tourists, who never knew the other face of Macau, and the cleaners who ready the city for the next plane load of enthusiastic passengers and the next train full of excited amateurs, with pockets full of cash and dreams of a rich future ahead of them.